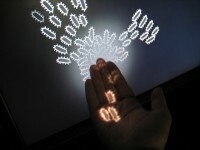 Chris Sugrue is an artist and programmer who develops interactive installations, audio-visual performances, and experimental interfaces that utilize technology in playful ways to investigate various topics, such as artificial life, eye-tracking, and optical illusions. She holds a MFA in Design and Technology from Parsons School of Design. She has exhibited internationally at festivals and galleries including Ars Electronica, Sónar Festival, Pixel Gallery, Medialab-Prado, Matadero Madrid, and La Noche En Blanco Madrid. She has taught courses at Parsons, the Interface Culture program at he KunstUniversität in Linz, Austria, and numerous workshops.